Plz, help me to design ABX auditory discrimination task!!! Can anybody help me to design neat and clear this task? I am new to this program and get in trouble with design the manual and operating it, I will be greatly appreciated if any body has the similar template for this experiment. I will do ABX discriminaion task for certain set of phonemic minimal pair, so the stimuli should be in certain set, for example, A-B-A, A-B-B with fixed word set(ex. dad-mad-mad).So far, I designed as follows: but I can't figure out how to manipulate those set with 3 sequential sound sampler with advanced-delay icon. I'll be appreciated for your help or any similar template that I could take as a reference!! But now I do not really get your issue with the advanced delay. Just enter the time you want between sound no? One more question, if I put this in random order, will each line be in the same trial but switch with the other trial, I mean the order of each trial can be randomly operated? 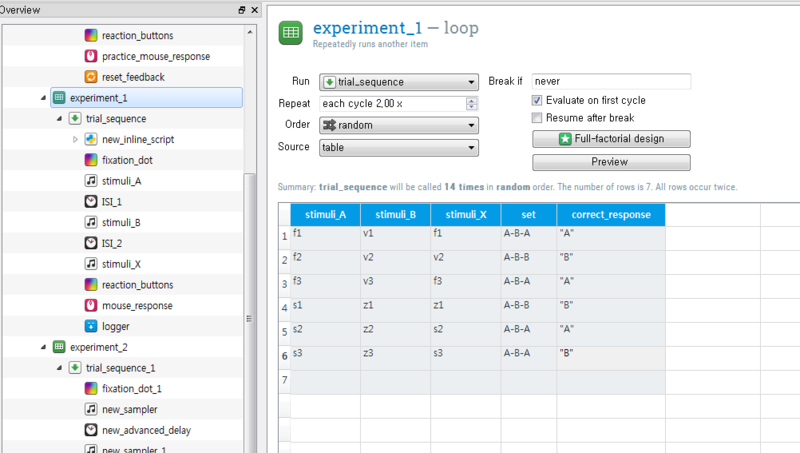 If you do this and enter random, it means that the whole sequences (A-B-B...) will be randomized. Lines are randomized, but elements within these lines stick together is what I mean. I dont know I hope I am clear. 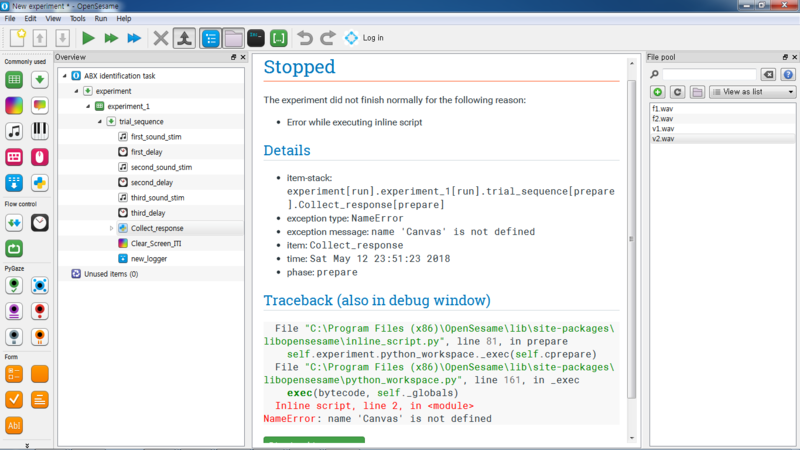 Would you help me to operate mouse_response from the beginning of the experiment? I tried to put python decode message that copied from other forum, but didn't work. Also, after listening to the stimuli, I couldn't click the correct button A or B.
Yeah I could hep but you need to tell us what you intend to do I do not really get it. I see from your screen capture that at the end of the sound sequence there is a reaction button slide and mouse response. What is the task of the subjet then? What do you collect? The experiment I will perform is ABX discrimination task which the subject should chose one identical sound of the third stimuli. For example, if the subject hear A-B-B sequence words, then he/she should click the button B. So, here are several problems I have. 3. After the subject listen to the trial, they need to click A or B that is shown in reaction-buttons. Here are some pictures that I did so far. I'm deeply appreciated for your kind help and suggestion. 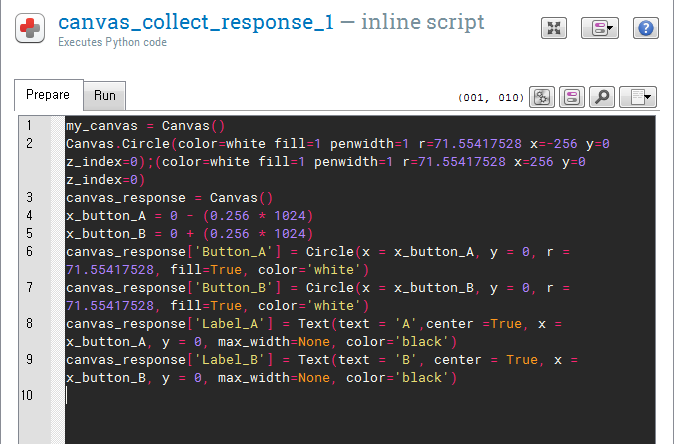 In order to do that I would rather use a canvas with a little bit of scripting. # remember (0,0) is the center of your monitor for open sesame! I hope the comment will make sense to you and you will be able to adjust them to your own experimental design. Thank you Sooooooo~ much for your kind help, Sylvain. 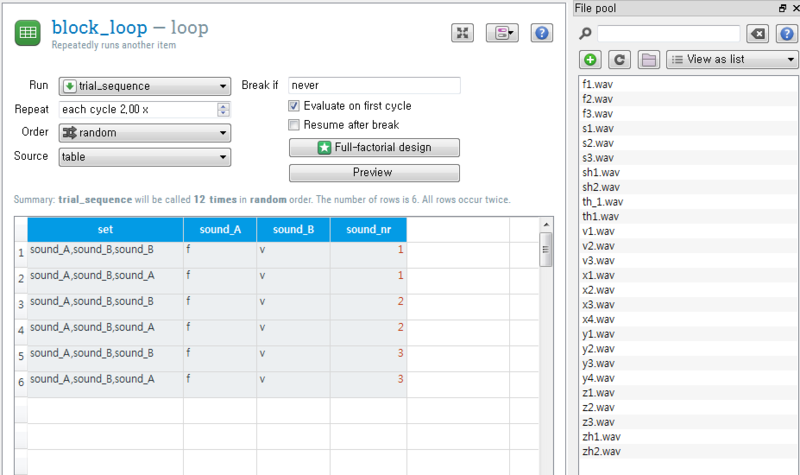 I revised my experimental design that is in the file. However, I cannot figure out how to define canvas. What I understand is my canvas is circle that has two position with text in it. 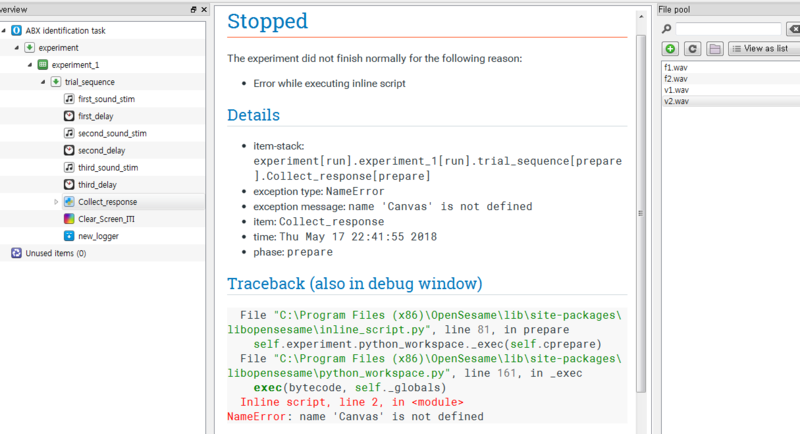 So, I define my_canvas like this and I got this error message. 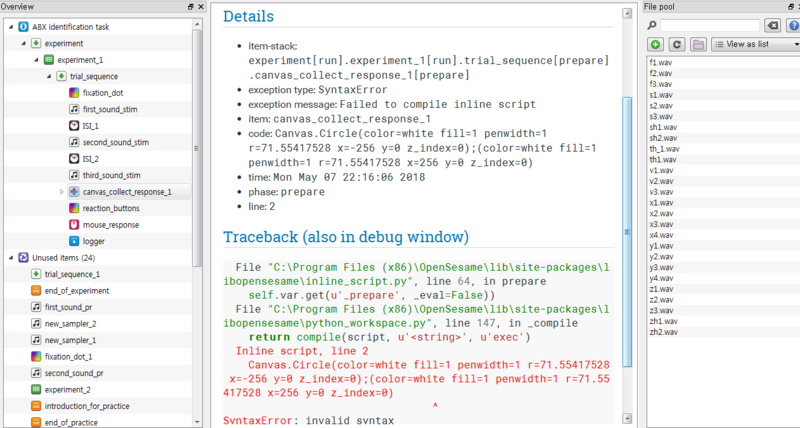 I am a real novice learner of opensesame and python code so I am desperately seeking your help. I attach the error message and my inline script below. Try to remember that your canvas is just like a canvas with a name. 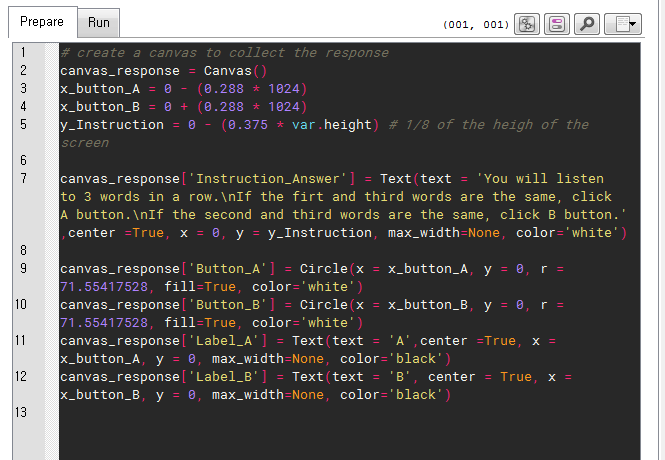 then my_best_canvas would be the name where you will put everything (circles, buttons...). Here in your script in your first line you are setting up a canvas called my_canvas, then you are drawing circles on a canvas that does not exist (Canvas.Circle). I did deleted and try to run the scrip again as well as look thoroughly the manual you mentioned, however the same error message occurs. If you don't mind would you check my experimental design. I am really sorry to bother you. Could you post a zip where you also include your sound otherywise I cannot run it. 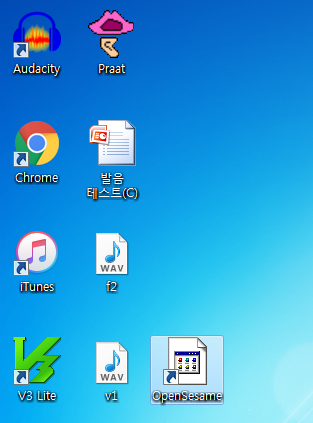 Oh, I save the sound file in the file pool. However, if that doesn't work, I'll attach them separately. Thanks. finally if you have your canvas it presents the display and collect the mouse response you do not need another sketchpad and mouse response item for that. Thank you Sylvain for your kind help with clear explanation. Though still canvas definition problem remains in my computer. 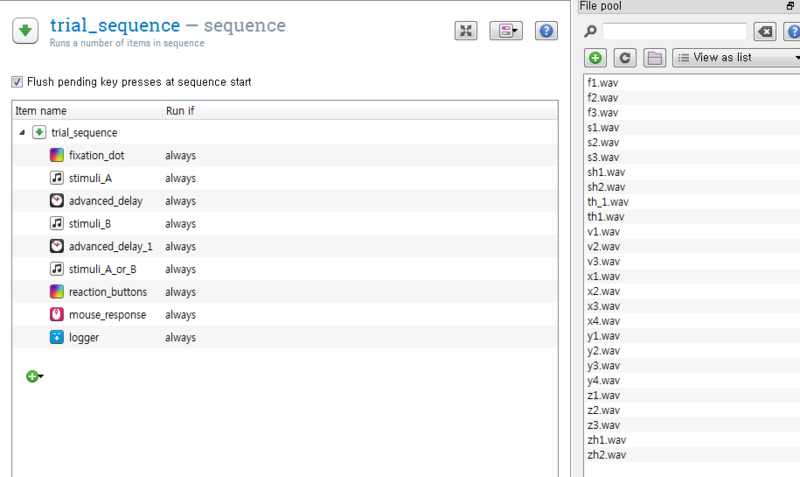 I just run the file you sent with sound file in the pool. (Is that because I didn't put the height of screen? if so, how can I get this height of screen? )May be I'll try keyboard correspondence instead of clicking button. Wow it is so odd. if you just open the zip file ABXnew.zip I posted, run it without any modification the error still happens? what is the version of open sesame you are running? 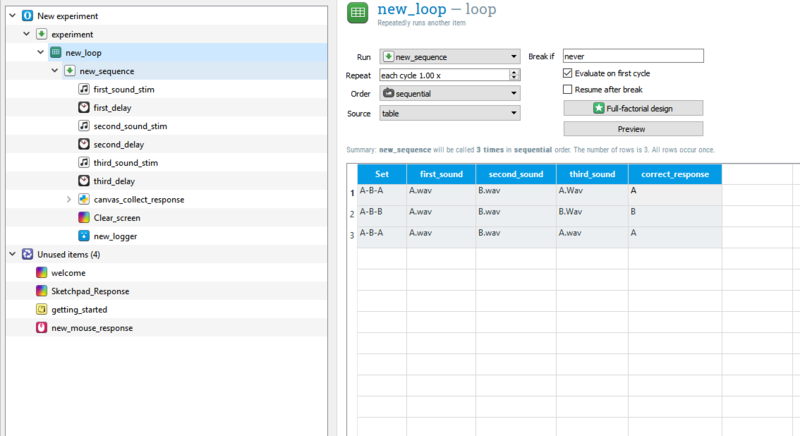 If I could use keyboard response instead of mouse and button, do I still need to type this inline script? I'm using window 7 is this the problem to run opensesame? The latest version is the 3.2.4 could you just install this one and try to run the script I sent without any modification? Wow! Finally, it works with the latest version! Thank you so much for your patience and big help! I'll definitely donate to this program~. Oh very nice that it works! Yeah I also do not have the icon but it is not really bothering!